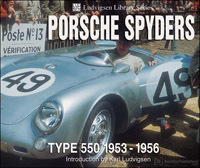 The pedigree of Porsche as car designers was brilliantly affirmed by its creation of the 550 Spyder competition roadster. See the 550 Spyder in all its variations, from its origins in experimental Porsche models to the amazing and finely crafted one-off specials of Walter Glöckler. With its superb four-cam flat-four engine, designed by Ernst Fuhrmann, the 550 became known as a giant-killer for its racing successes on tracks all over the world. As tough as it was handsome, the 550 was winning races years after its official launch at the Paris Salon in 1953. Exclusive photography of the 550 in the Ludvigsen Library shows its engineering, its evolution and its action in races in Europe and North America.